Recent research (Brown, Hyer, Ettenson, Spring, 2017, 79-87) suggests that there are multiple variables that impact any project or change initiative. We often assume that these variables are simply standard business practices without determining how these shifts effect the project and change initiatives. For example, shifting organizational priorities, changes in leadership, and distrust concerning the project plan (and approval) are common variables that occur without fully vetting the impact on the project or change initiative. 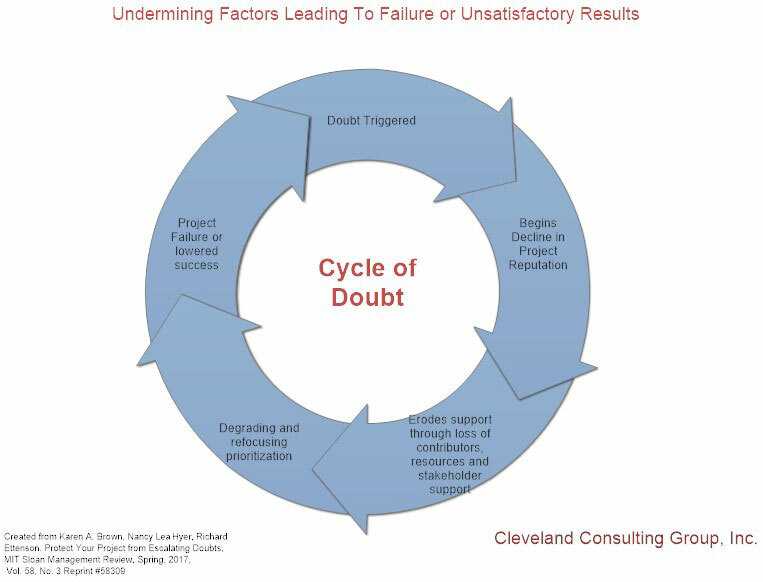 These variables can trigger the cycle of doubt that suddenly begins to undermine the support of the project. As indicates in the diagram, once doubt is triggered, the reputation (perceived value) of the project or change initiative begins to diminish. Instead of full support, the loss of reputation begins a subtle, almost insidious, erosion of support in the form of loss of contributions (and contributors), resources, and stakeholder support. Possibly discussed with others, yet clearly enacted, each functional leader begins to lower the commitment and prioritization of the project or change initiative. As a critical mass of people, processes, and prioritization is diminished, the project either fails or its ultimately forecasted success never materializes. Although the cycle of doubts suggests five stages, there are four perceptual processes that occur that actually keep the cycle hidden within one’s own perceptions. 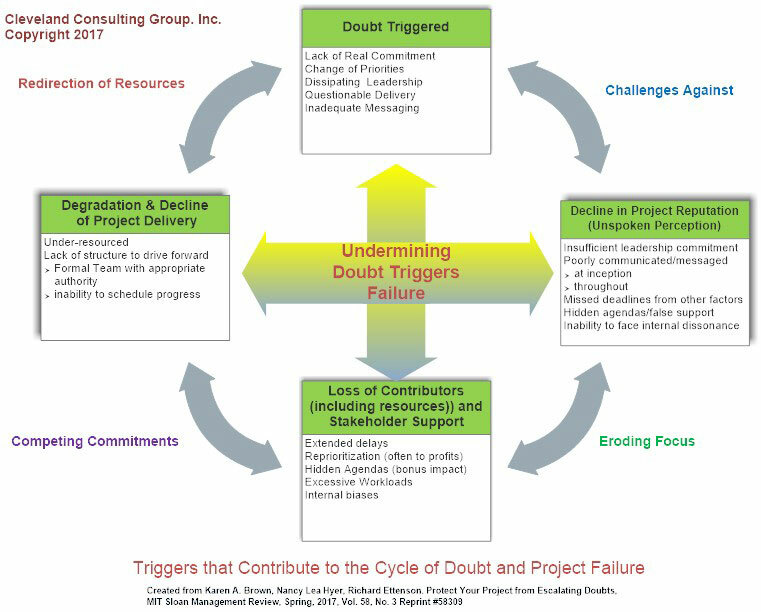 As indicated below in the diagram, when doubt is triggered, there is a perception that the project or change initiate has been challenged which triggers an internal doubt surrounding the commitment to the project. This can be triggered by the failure to receive or provide full commitment, an unexpected change in organizational priorities, dissipating leadership, questionable delivery potential, and/or inadequate messaging. Perceptually, this is seen as insufficient leadership commitment from others, missed deadlines that are perceived as self-justifying beliefs for action, selecting or holding hidden agendas through false support, hearing and using internal dissonance to justify one’s declining commitment, and miscommunication and misunderstand throughout. This leads to an eroding focus upon the project or change initiative. Extended delays are viewed as pre-failure symptoms instead of normal problems to address. Self-justification begins to develop surrounding reprioritizing toward profits and managing hidden agendas to insure bonuses. Increased project focus becomes the new reality that the excessive works-loads are not sustainable. Internal biases are heightened against the project or change initiative. As the focus (commitment) erodes, a sense of clarity seems to develop that creates a sense of competing commitments. The competing commitments are based on doubt that is not discussed as much as it is the driving energy that an either/or decision must be made. These decisions lead to reallocation that under-resource the project or change initiative. Without adequate explicit and enforced support, project team meeting becomes impossible to schedule or the team cannot make formal decisions. Everyone develops a self-fulfilling prophecy by believing fully justified to redirect resources to what is perceived as a more likely to succeed project. The under-resourced project under-performs and/or completely fails. The final layer of complexity is to realize that the project or change initiative has four manageable functions: (1) Priorities; (2) Leadership; (3) Delivery; and (4) Messaging. Executive leadership must manage the prioritization (importance) of the project or change initiative by understanding the constant interplay between culture and profits. Culture is the embedded perception of how things get done within the organization. Not managing the how things get done for the project or change initiative, can led to triggering doubt. The most oft example is refocusing on profits without clarifying the relationship of the organizational and functional performance and the commitment to the project or change initiative. Similarly, the project or change initiative must be maintained. Any change of sponsors or project leaders must be diligently managed to ensure a successful hand-off (not set-up to fail). All dissonance, including self-serving agendas, must be fully addressed and not forced into the background where it will grow into fully developed doubt. Project and change initiative sponsors and leaders must have formal authority and structure to ensure adequate support and resources. Otherwise, a fading of leadership support will occur that leads to the erosion of focus. Executive leadership is flat-out responsible for ensuring delivery. This is not hard-handed leadership micro-managing, but managing the perceptions and behaviors that ensure delivery. Hence, executive leadership needs to monitor such things as are project or change initiative meetings being scheduled without inordinate delays. If not, it suggests fair weather support such as nodding yes without commitment while thinking about playing golf. The executive leadership must find the balance between enough extra effort to push the project through without creating undue stress and unrealistic workloads. Signs of a lack of stress and unrealistic workloads are apathy, fatigue, and veiled attacks about the project. When these are seen, project leaders have likely eroded their focus and moved into competing commitments where they are now choosing to under resource the project as a hedge toward success elsewhere. Finally, executive leadership must manage all messaging including modeling the messages towards success. Often, the error is not acknowledging that the executive is the message throughout the organization. If all messaging is not done by internal communication with consistency and congruity with the project or change initiative original purpose, it creates a communication vacuum that is filled with the imagination of each leader and member of the team. The tyranny of distance begins to occur as messages only about performance measures come from mount high without any relationship to the project or team. The lack of face value (leadership engagement) can lead to demoralized action that begin to redirect resources. Common symptoms are inflated or not quite true performance reports, veiled negativity towards the projects, and a general display of the failure to listen by the project team and executive leadership. 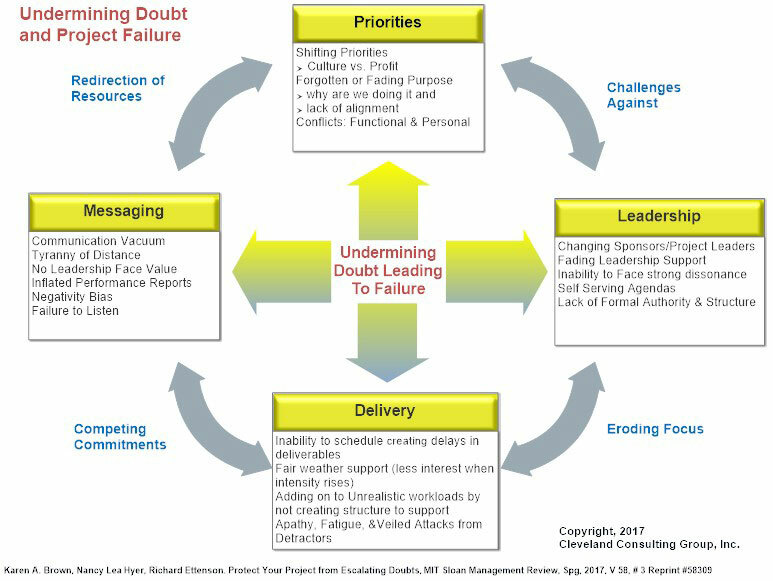 Leaders and Coaches/Consultants working with these models to determine the perceptions and behaviors that can trigger doubt within the organization will find that that they can manage project and change initiatives more effectively. Moreover, the diagrams in this article can support isolating what is creating the feeling that something insidious or at least unspoken is undermining the project or change initiative’s success. Furthermore, it attests to the need for more leadership engagement of the four manageable functions described in the directly preceding paragraphs and depicted in the diagram below. Combined, leaders can be more effective and coaches and consultants can support their clients to be more effective.